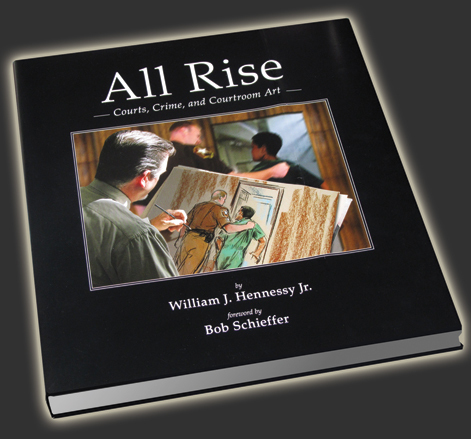 ALL RISE-by William J. Hennessy Jr.
by William J. Hennessy Jr.
All Rise is a 250 page, large-format book, rich with hundreds of full-color illustrations highlighting sensational cases that riveted the attention of the country. Featuring cases from the courthouses of DC, all the way to Guantanamo Bay! White House CIA leak, The DC Snipers, Moussaoui / 20th Hijacker, Microsoft Antitrust Trial , Zapruder, The Kennedy Assassination, Dr. Cecil Jacobson, Impeachment of Pres. Clinton , Kasi / the CIA Ambush, Marv Albert , John and Lorena Bobbitt , DC Mayor, Marion Barry , Iran Contra , John Walker Lindh , “The American Taliban”, Mike Tyson, Guantanamo Bay, Michael Vick, Supreme Court and others. This is a must-have for any Lawyer, Law firm, Judge or anyone with an interest in the American legal system. This powerful and provocative illustrated memoir of historic court cases by renowned court artist William J. Hennessy Jr. will be treasured for years to come. Reserve your copy of today and you’ll be among the first to receive what is sure to become a library favorite. As I drove east on the Dulles Toll Road headed for the Capital Beltway, I was anxious and worried that I might not make it in time. Bruce Leshan, a reporter with WUSA TV 9, a local DC news station, had called and asked me to hurry to the Seven Locks Detention Center, some 20 miles away in Montgomery County, Maryland. He wanted me to catch the first glimpse of the two people suspected of being the D.C. snipers who had terrorized residents throughout the Washington, metropolitan area for three weeks. The snipers had shot twelve people at random, killing ten. The reporter said with some uncertainty, "We think that's where they're taking them." As I drove, I tuned my car radio to WTOP, a news station that was providing the latest details on the arrests of the suspects. The newscaster, too, was speculating about where the suspects would be taken first. My cell phone rang; it was Bruce Barr, an assignment editor at CBS News who asked me to head to the federal court in Baltimore, Maryland—some 40 miles north of my original destination. "We hear that's where they're taking them," he said. I was perplexed. I respected both sources, but they couldn't both be right. I gambled that the editor at CBS was right and took the exit leading toward Baltimore. It would take me almost an hour to reach Baltimore. I continued to listen to the news all the way there, but I was still not sure I had made the right decision. The U.S. District Court in Baltimore is just off Interstate 95 near the scenic waterfront. Was I in the right place, though? As I headed along West Pratt Street, I approached the cold, gray federal building, noticing that it looked pretty quiet. If I'm wrong, I thought, it's too late to make it back to the other location. I turned left onto Hanover Street, which runs in front of the courthouse, and saw the perimeter of the courthouse grounds surrounded by heavily armed men in dark uniforms as well as numerous police vehicles. Crowds of people had gathered along the streets on the opposite side. Overhead a black helicopter hovered. I was in the right place! My day was just beginning. I am an artist, a courtroom artist. Sometimes it drives me crazy, but this is a great job!